Hi friends! Have some of you started your winter break already? We have another week to go! I wanted to share some December/holiday ideas for those of you who still have another week and need some ideas to get you through the week! Our room neighbour made us these awesome holiday themed salt trays! She added glitter to the salt and had the kids write in the salt with candy canes. I got these from the Scholastic Elf (December) catalog and they have been a hit with the kids! 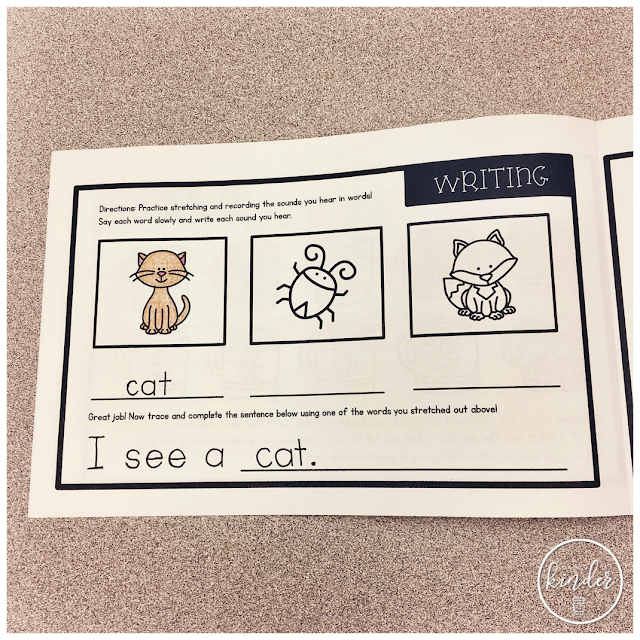 It is great fine motor practice and for adding details to pictures, labeling the picture etc! 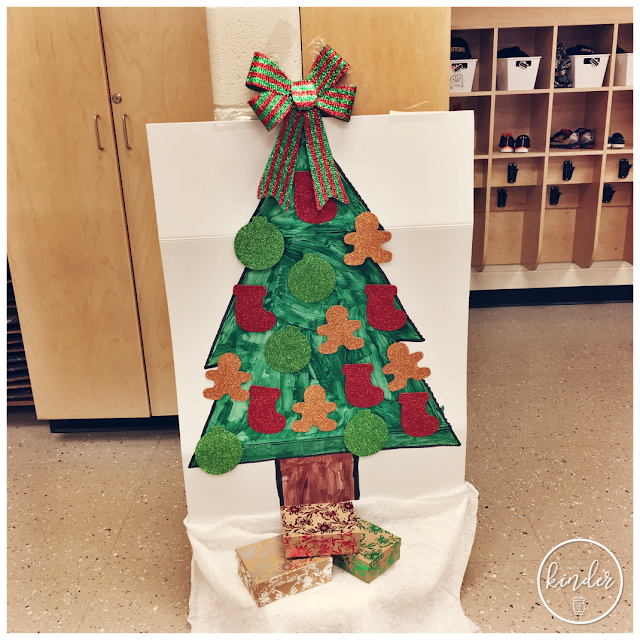 We drew a tree on the presentation board, the kids painted the tree and then my ECE added the bow, white felt and bow. Then she added the velcro on the tree and the ornaments so that the kids could trim the tree! 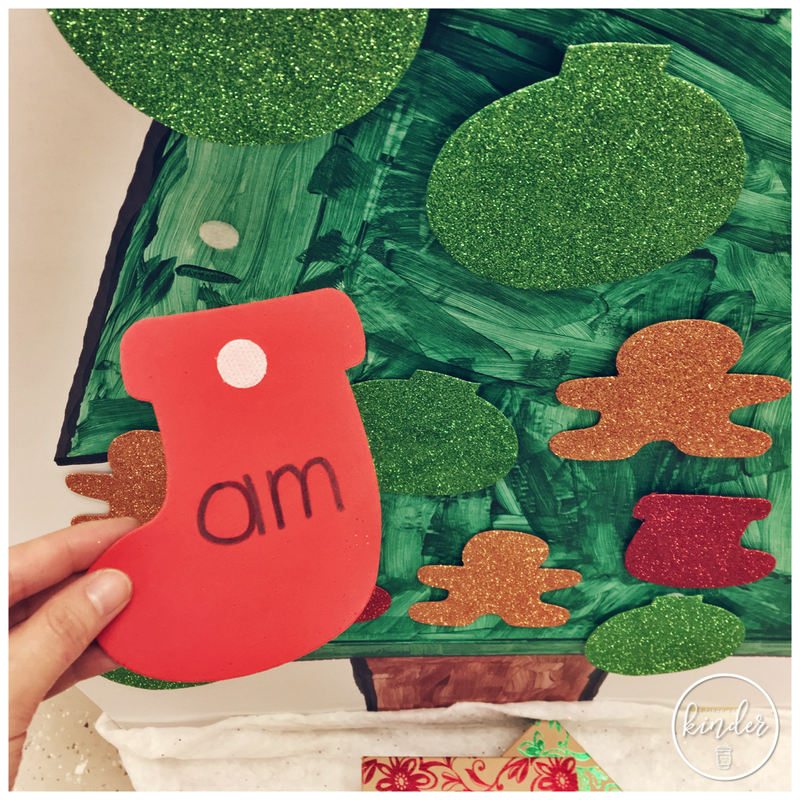 There are sight words on the back of the stockings, numbers on the back of the gingerbread men and dots for the students to count on the back of the ornaments! I got this centre idea from @joysofkinder on Instagram! I set out jumbo popsicle sticks, Christmas clips (they are from Michaels) and wooden numbers (also from Michaels) and had the students clip and create sets. 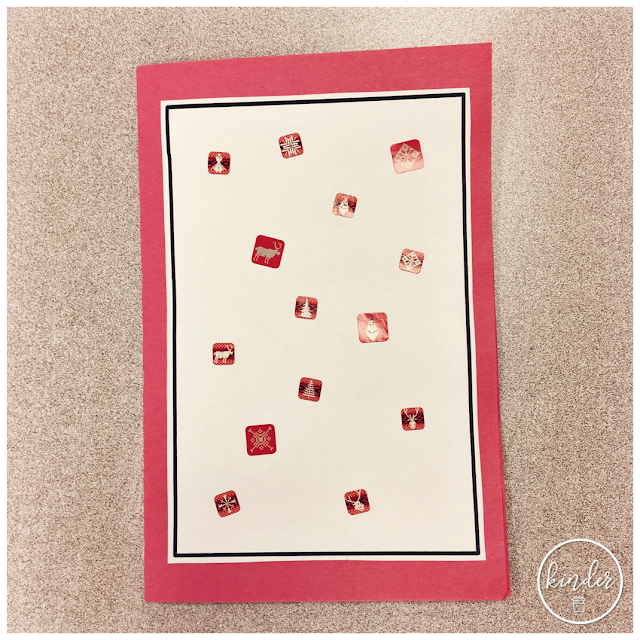 You can see more centre ideas (with lots of freebies) in my past December posts here and here. This year we made these finger print ornaments for the kids to give to their parents. They made a finger print with brown paint and once it dried they added the antlers and eyes with a black sharpie and a nose with red paint and a q-tip. 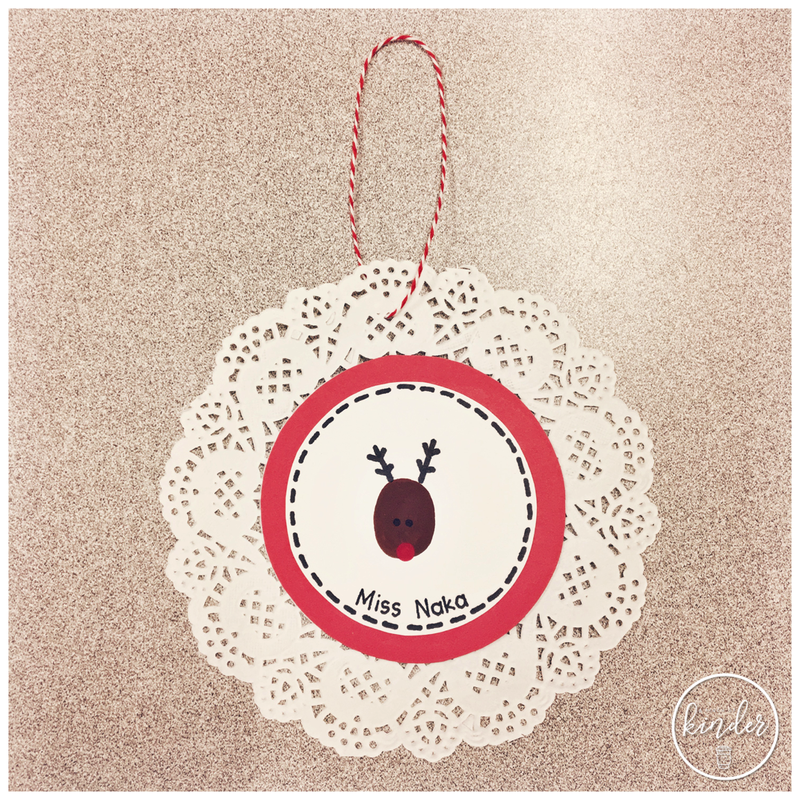 I outlined the circle with the dashes and the kids got to choose whether they wanted their ornament backed on red or green paper. I either wrote their name or some kids wrote their own name. At the end I glued it on to a doily and put some twine at the top and tied it to make it an ornament! 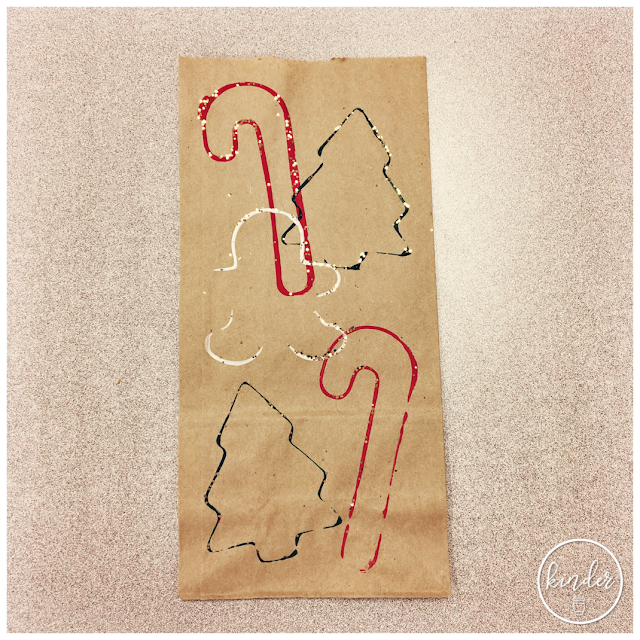 We made these gift bags to put the ornaments in. We set out holiday themed cookie cutters with red, green and white paint and had them stamp the paint onto the paper bag. They had the choice of sprinkling on a little bit of gold glitter before carrying it to the drying rack. This one is my example but this always turn out so pretty and unique! For the cover of the card I just let the kids decorate with holiday stickers or stamps. For the inside they either used my example and wrote their own or used a template and filled in the blank/traced the message. Click here to see what I did two years ago! I can't remember where I originally saw this idea, but when I saw that they had a 10-pack of Blistex at Costco, I knew I had to make these! 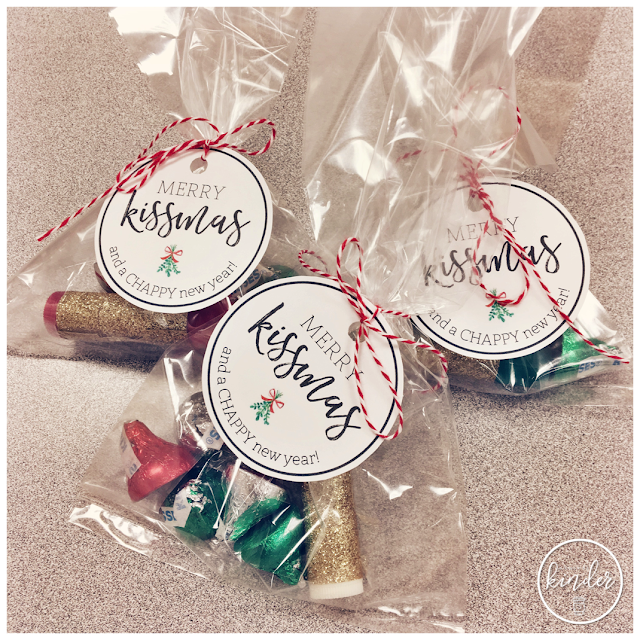 I wrapped the lip balm in glitter tape (I used the Scotch glitter washi and I had to hot glue the seems to keep it down) put them in a cellophane baggie with some hershey's kisses and added the tag & twine. Easy peasy and 10 gifts cost me under $20! You can grab the tag for free by clicking here. Every year I send home a little winter break challenge in an attempt to encourage the kids to incorporate reading, writing and math into their day during the holidays. 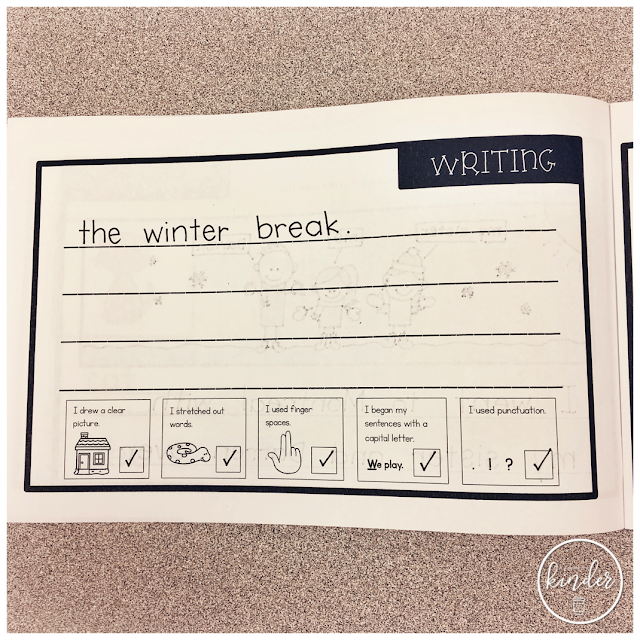 Last year I sent home this booklet that goes with the book "Sneezy the Snowman". 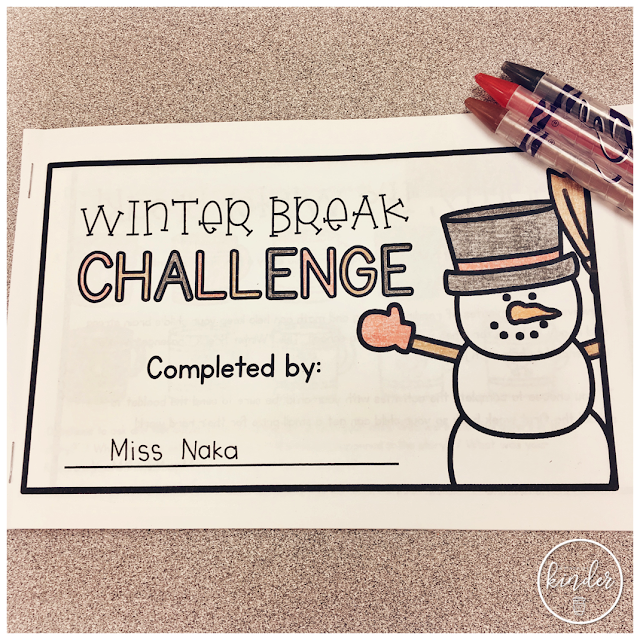 This year we are giving them the book "Snowman for Little Bear" by Trace Moroney and sending home this Winter Break Challenge. 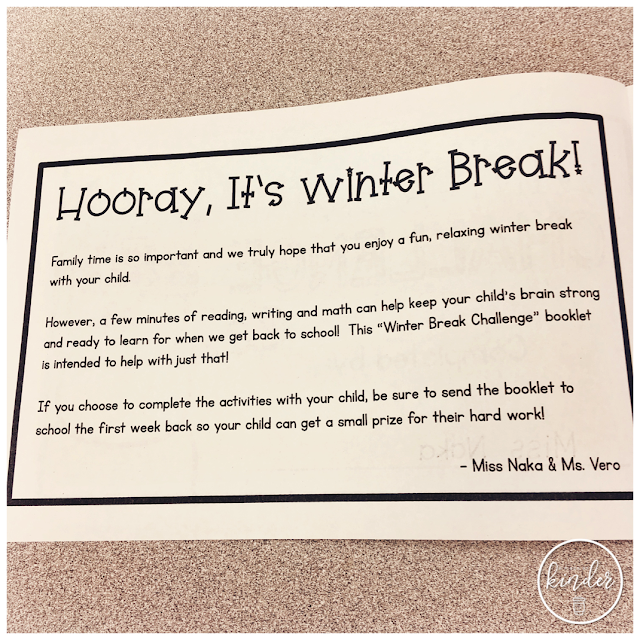 Their first challenge is to read books on 10 different days. There are some comprehension questions at the bottom to encourage the parents to talk about the book with their child. 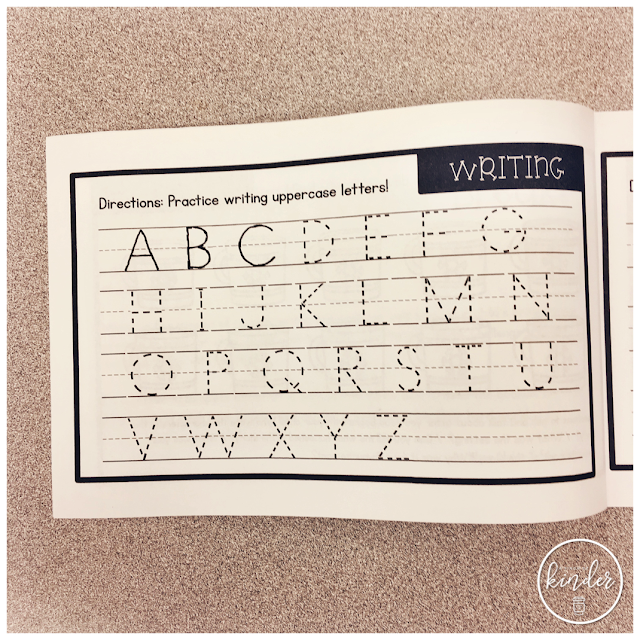 And for the kids who are ready I am putting these CVC and sentence practice page instead. and it has a little writing checklist on the back to help parents remind the kids about writing conventions. 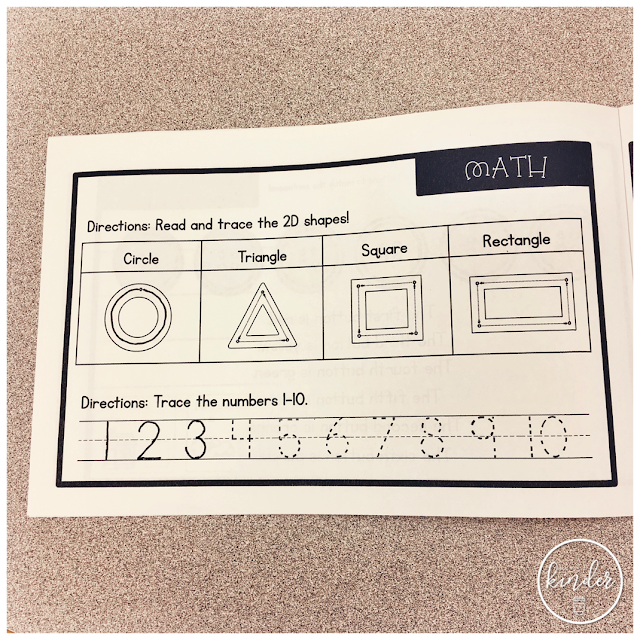 We have a shape tracing section to reinforce shape ID and a number tracing section on this page to practice number formation. 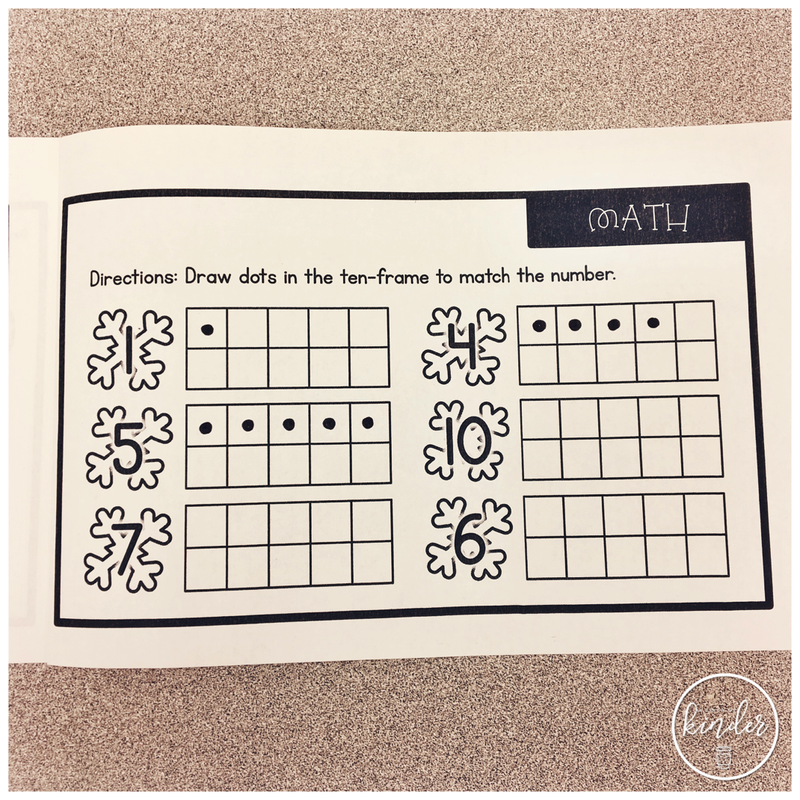 I also recently taught ordinal numbers but when I did my summative assessment I realized many of the students need more practice with this. 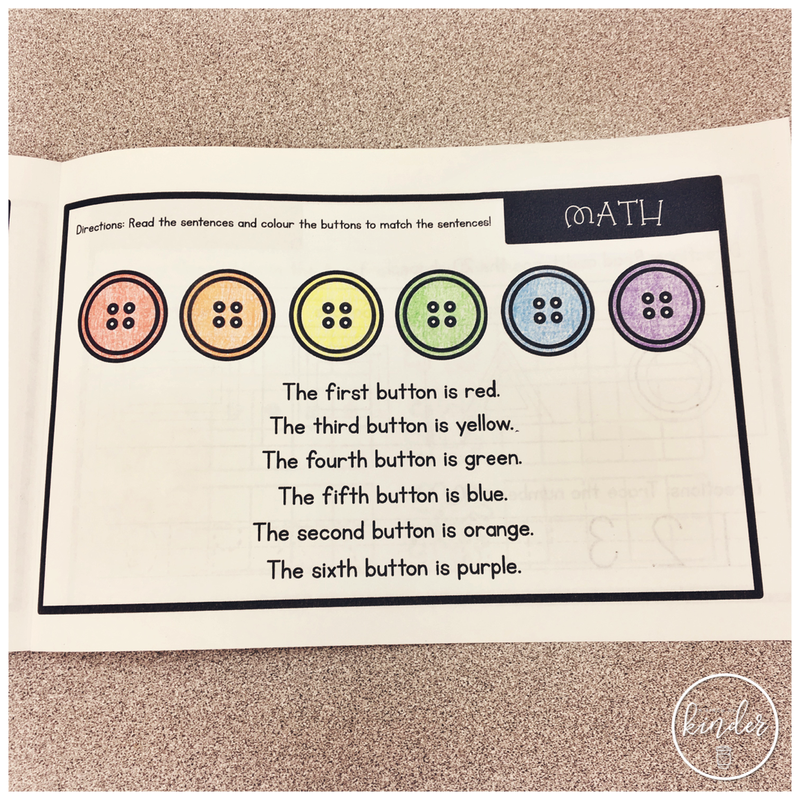 So I included this ordinal number button colouring page as well. 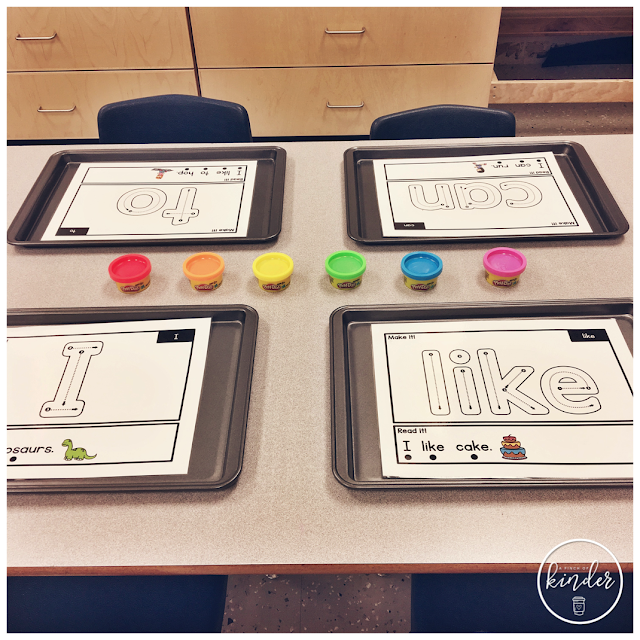 Lastly, lots of my kiddos still need practice with creating sets. So I included this page to help them practice that! 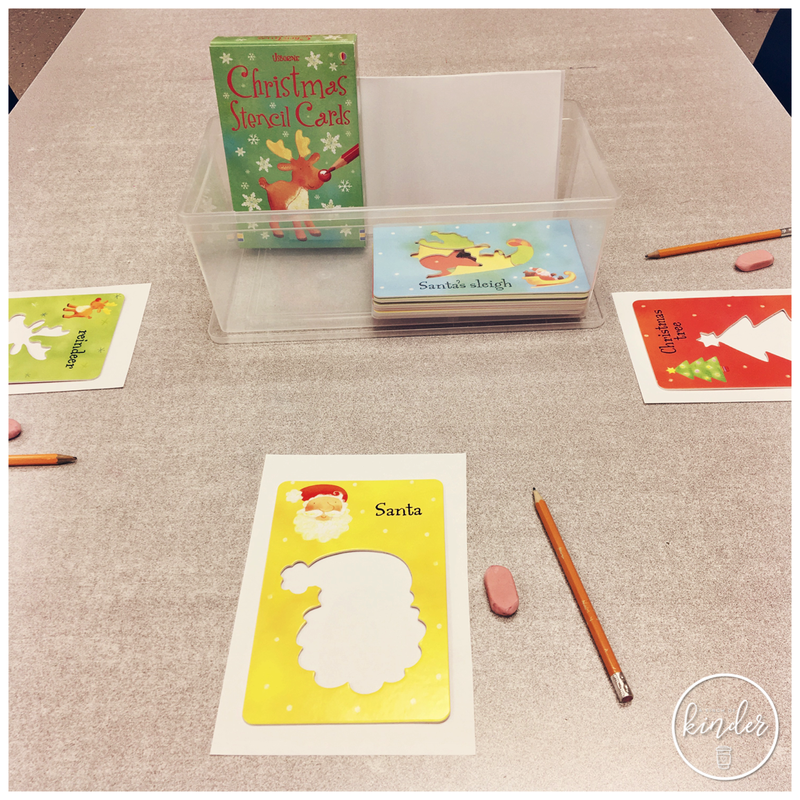 I hope this post was able to give you some ideas for December in the classroom! 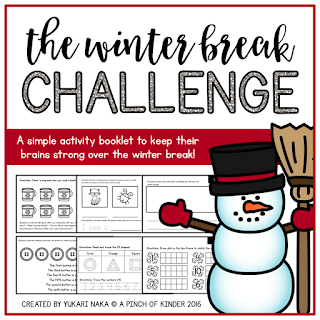 What are your favourite activities and resources for December? 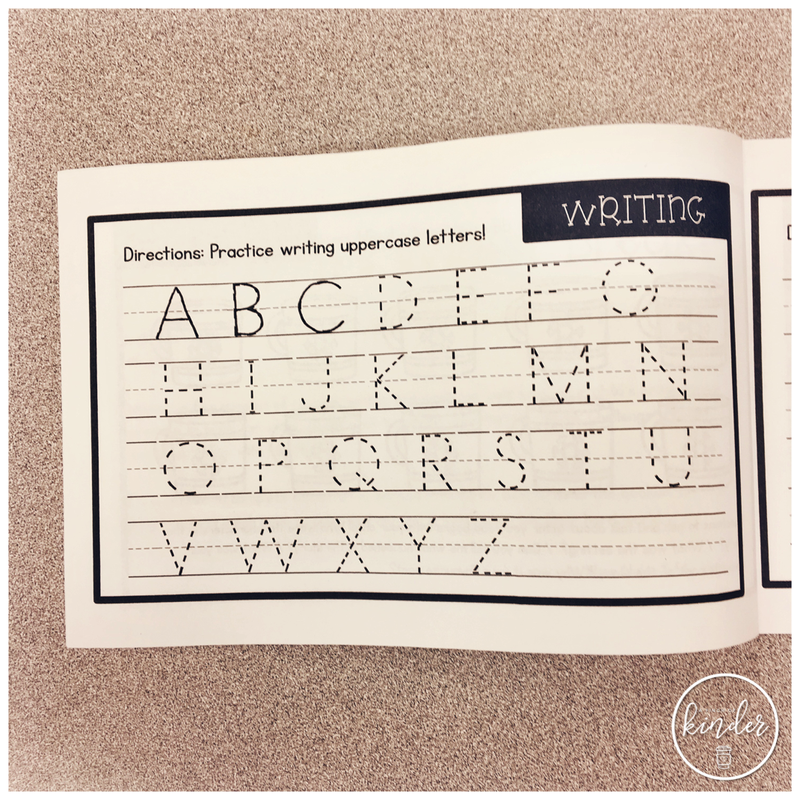 I'm linking up with Kacey from Doodle Bugs Teaching to share 5 things from my week! My ECE made up this trim the tree centre and it came out so cute! I drew the tree onto a presentation board and my ECE worked with the kids to paint it. Then she taped it to the wall and added the velcro, bow, white felt and present boxes. The ornaments are in the boxes and they have sight words, letters, numbers and dots on the back. 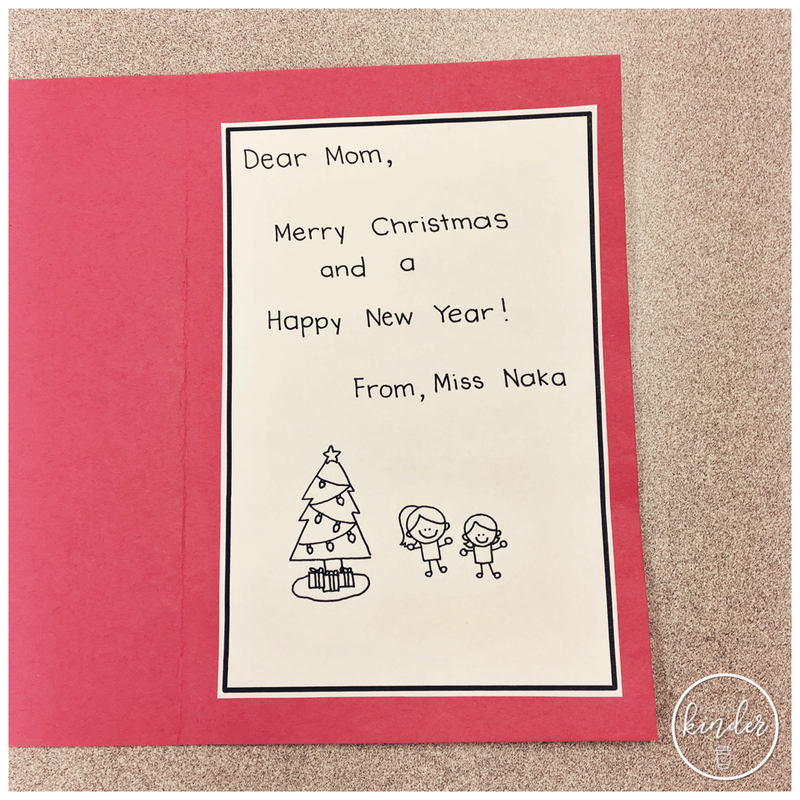 The kids are encouraged to read the back as they trim the tree! I made up this number stamping sheet for the kids to practice identifying numbers and making sets. 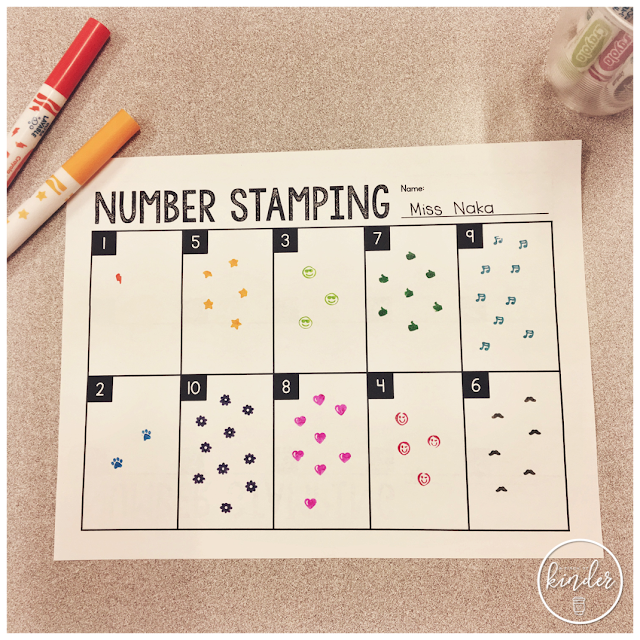 The back has numbers 11-20 for the kids who are ready for bigger numbers. 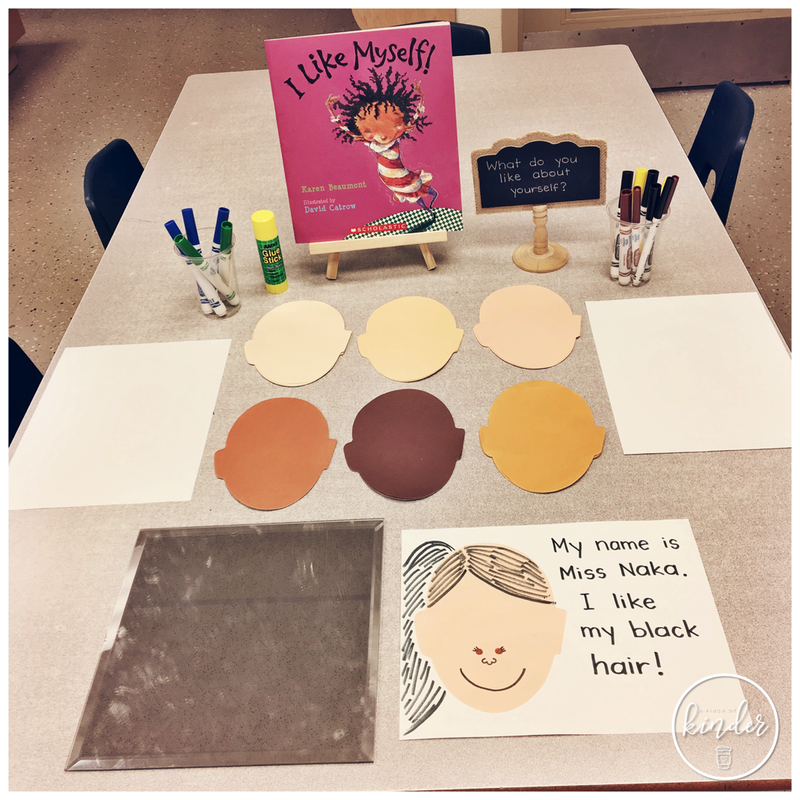 They loved this and did a great job with it! I got the stamp markers from Walmart. I got this centre idea from @joysofkinder on Instagram! 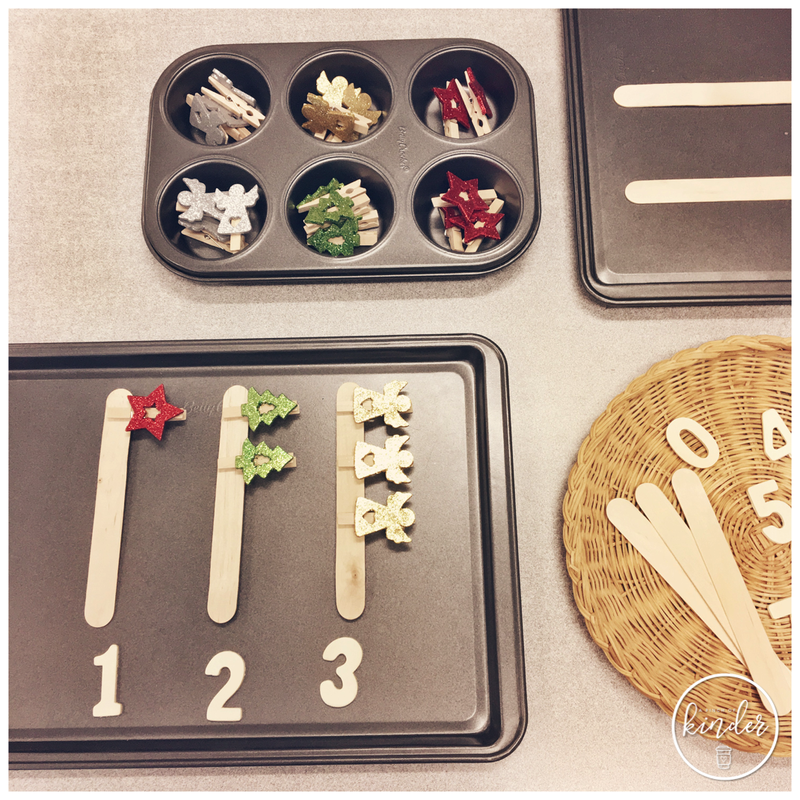 I set out jumbo popsicle sticks, Christmas clip (they are from Michaels) and wooden numbers (also from Michaels) and had the students clip and create numbers. 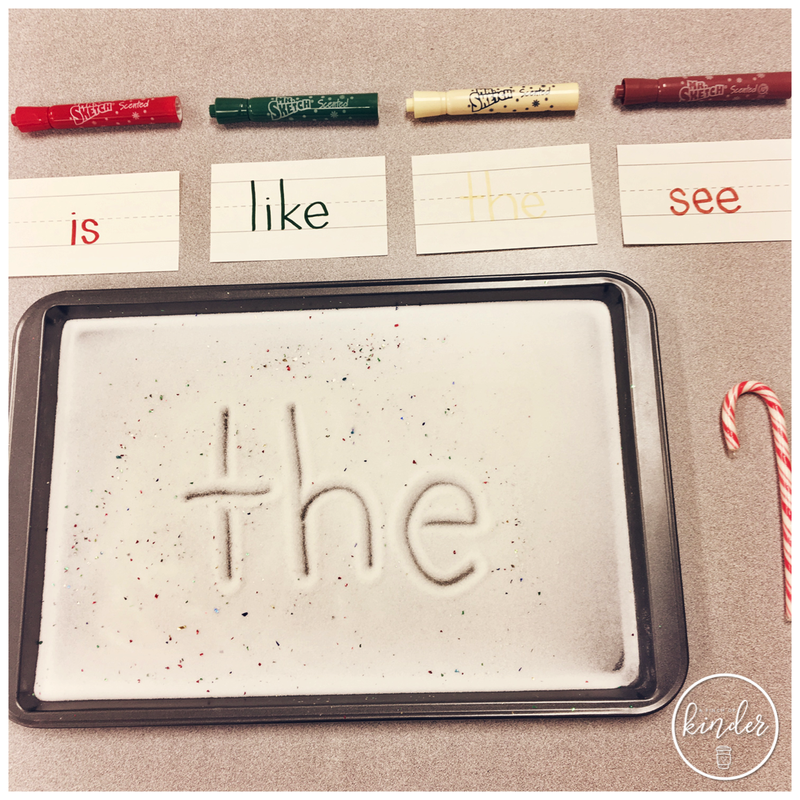 We have been using these mats with play dough but this week we decided to switch it up and make the words with Christmas coloured rhinestones! The rhinestones are small so it gave them a good opportunity to refine those fine motor skills we are working hard on! 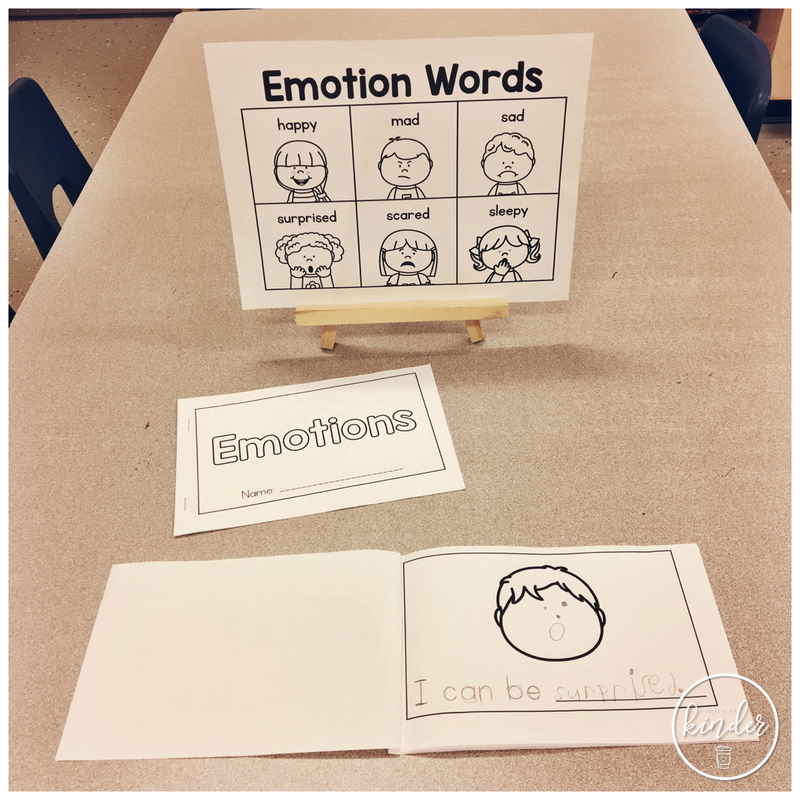 This week our focus sight word was "be" so we made these emotions booklets! 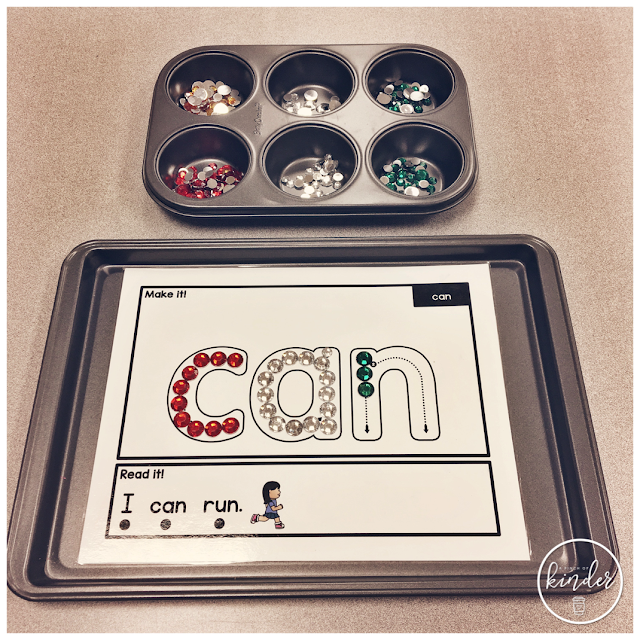 They trace the sentence starter "I can be" and fill in the blank with an emotion. I put the emotion words on a stand to support them. Then the kids drew a face to match the emotion they wrote! They loved this! 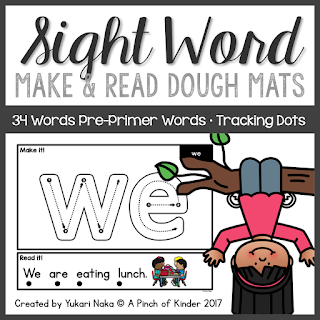 I've also had requests to make more sight word booklets like this and the ones I posted a few weeks ago (you can grab those as a freebie here) so I made a whole set for pre-primer words! 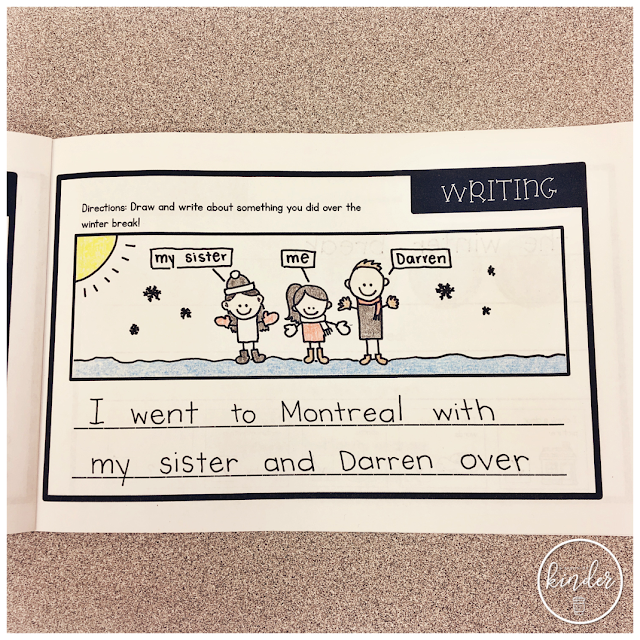 Welcome to another Five for Friday where I share 5 things from my week! I had a lot of questions on Instagram about the faces. My teammate says they are from Scholar's Choice! 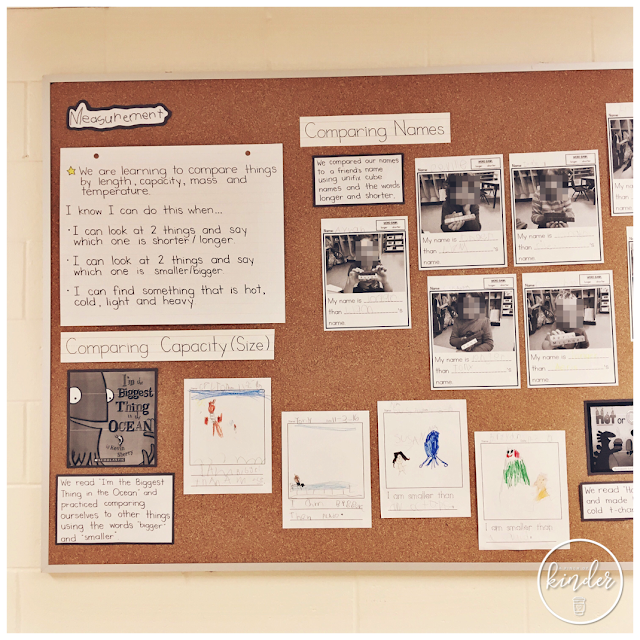 Last week we wrapped up measurement so we finally put up our learning on our outside bulletin board. hot and cold t-charts and heavy and light t-charts. Some of the girls also decided one day to measure the length of the table using unifix cubes so I documented that as well. 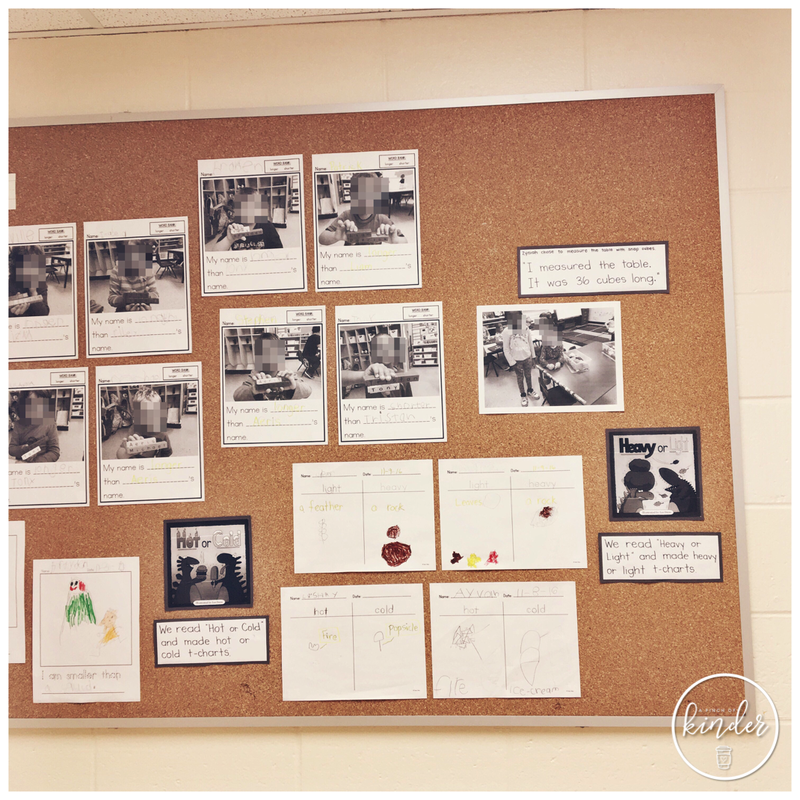 All of the printables you see on the bulletin board can be found here. We learned about 3D figures after measurement. One activity they enjoyed was this tower building activity! 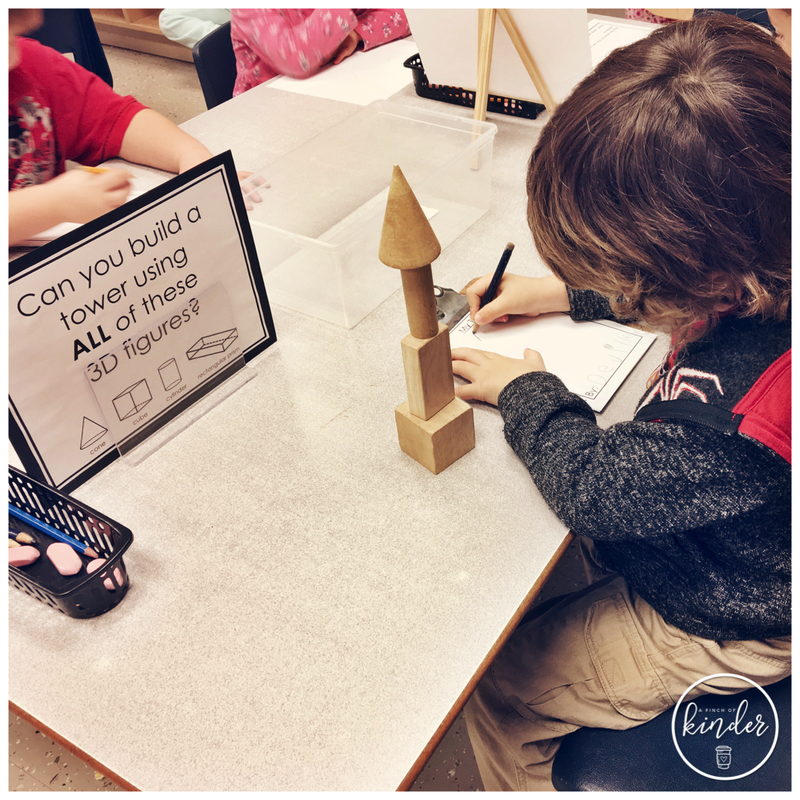 Students were encouraged to make a tower and record their tower. I also asked the students to tell me about their tower and documented what their knowledge of 3D figures. I also challenged some of them to find all of the different ways they could build the tower using the figures they were given! Most of my kiddos this year have learned most of their letters and sounds already but they still love play dough so I wanted to make something a little more challenging than the alphabet play dough mats I had been setting out. I like them because the kids who are still working on letters can still practice forming them and identifying them but the kids who are ready can start to practice making sight words! I also added the "read it" section at the bottom. 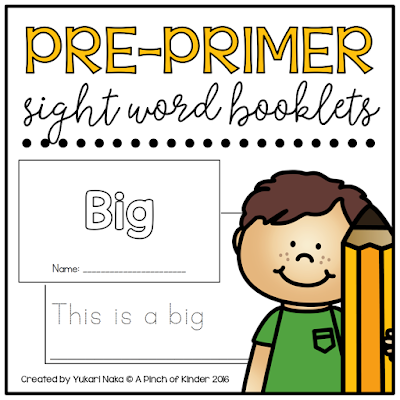 I used pre-primer sight words and a picture cue so that it would be easily decodable by emergent readers. 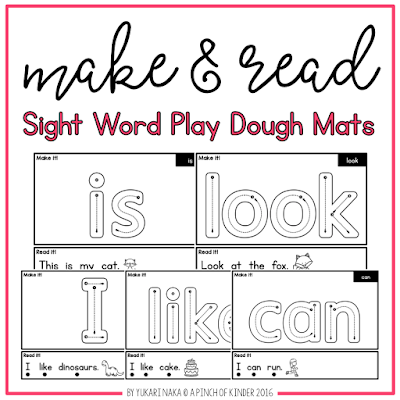 If you would like to grab these mats, you can find them in my TPT store. Click here or on the image below to check them out! 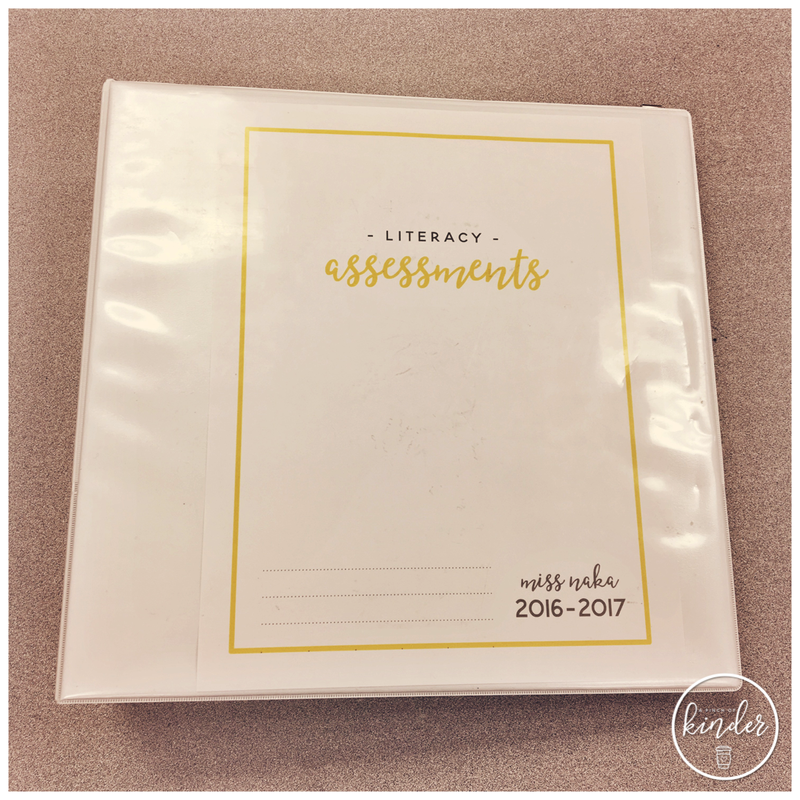 So many of you have been asking about my literacy assessment binder after I shared my numeracy assessment binder. You can read that post if you are interested here. Truth be told, my literacy assessment binder is nearly not as comprehensive. But I thought I'd still share in case it is helpful to somebody. 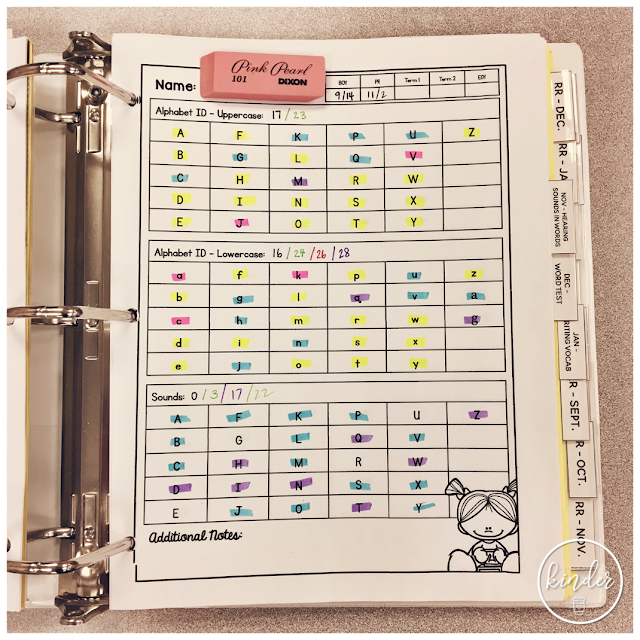 In my inside pocket I keep my Reading Progress Letters that I send home after I do running records (with the SK's and the JK's who are ready) to help parents understand their child's areas of need and what they can do at home to support them. Our board's expectation is a PM Benchmark level 6 at the end of Kindergarten, so that is stated on the sheet. 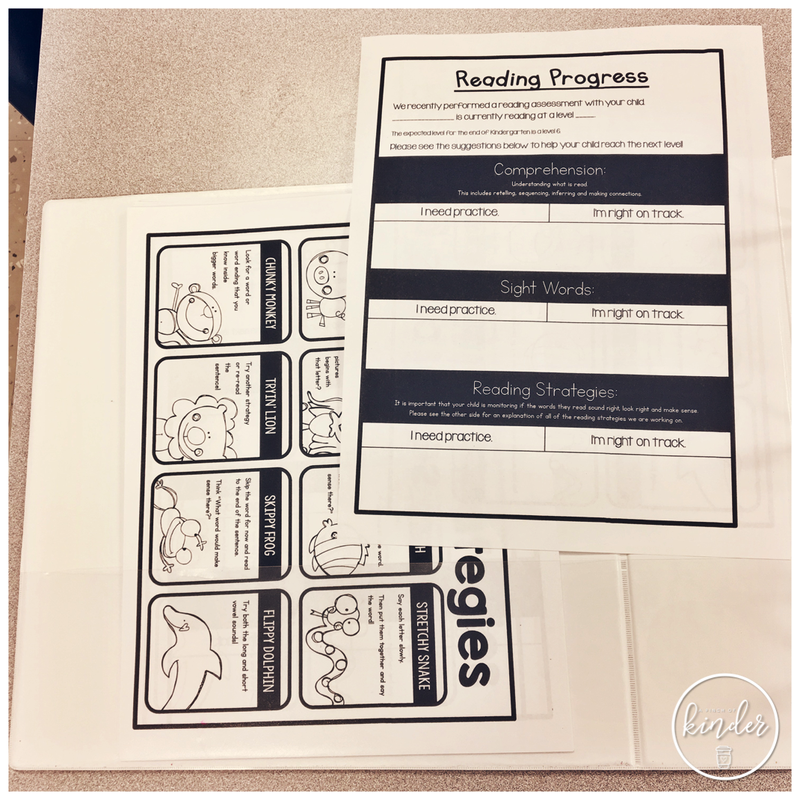 The back of the reading sheet are the reading strategies. 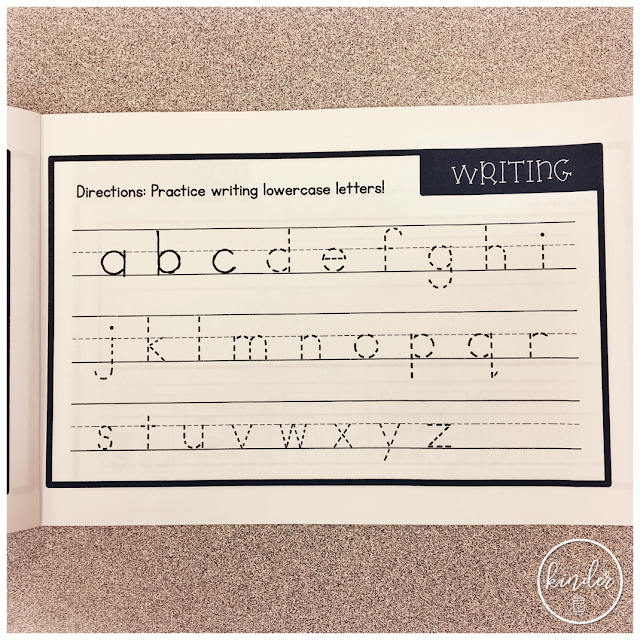 Often times I will write a reading strategy to practice on the front and then highlight the strategy on the back. 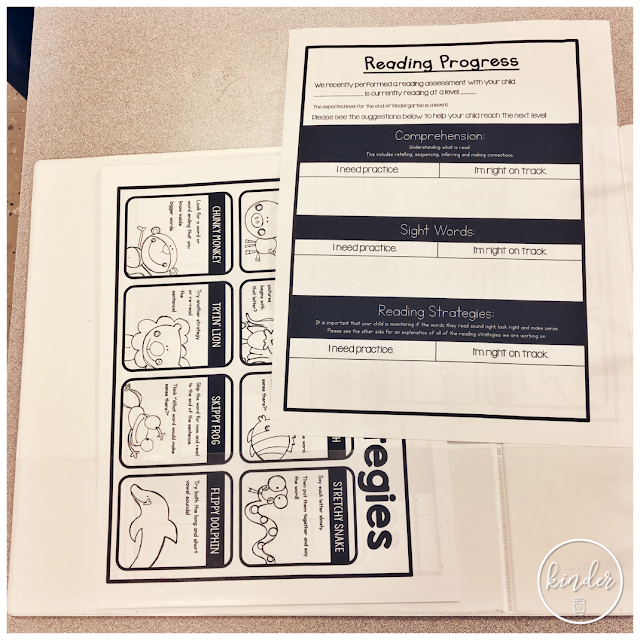 You can find this sheet in my Reading Strategies pack on TPT here. The first thing I have in my binder is this clear binder pouch where I keep the letters/sight words my intervention kids are working on. 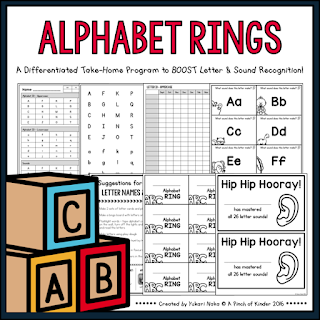 I put 10 letters or sight words on their ring at a time and they practice them for a week. I check their rings once a week and if they have mastered the letter/word it gets a checkmark and I take it off the ring and replace it with a new word/letter from this pouch. 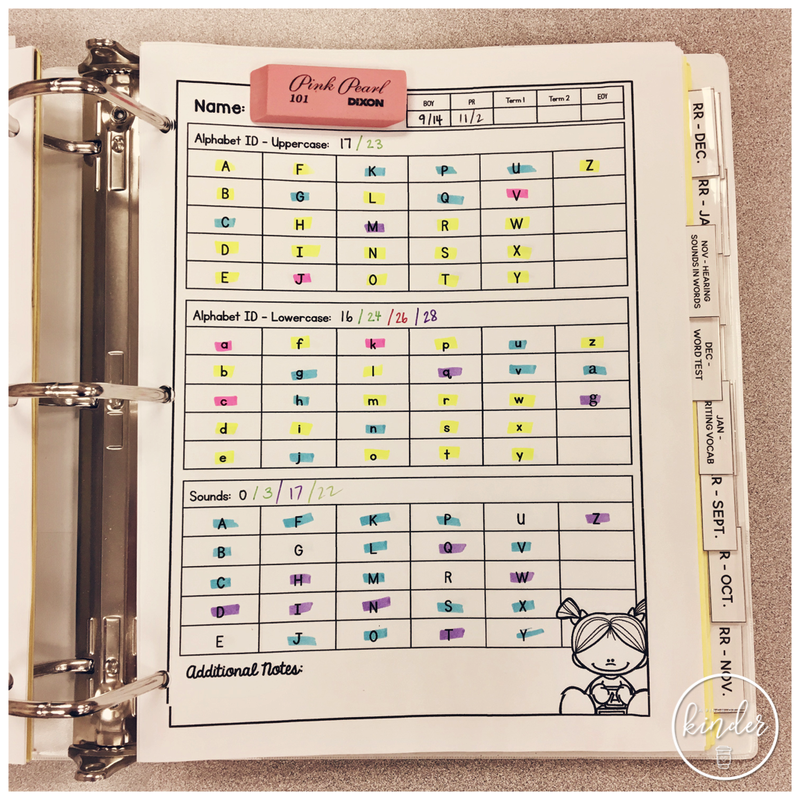 This helps me see general progress and needs of the whole class. 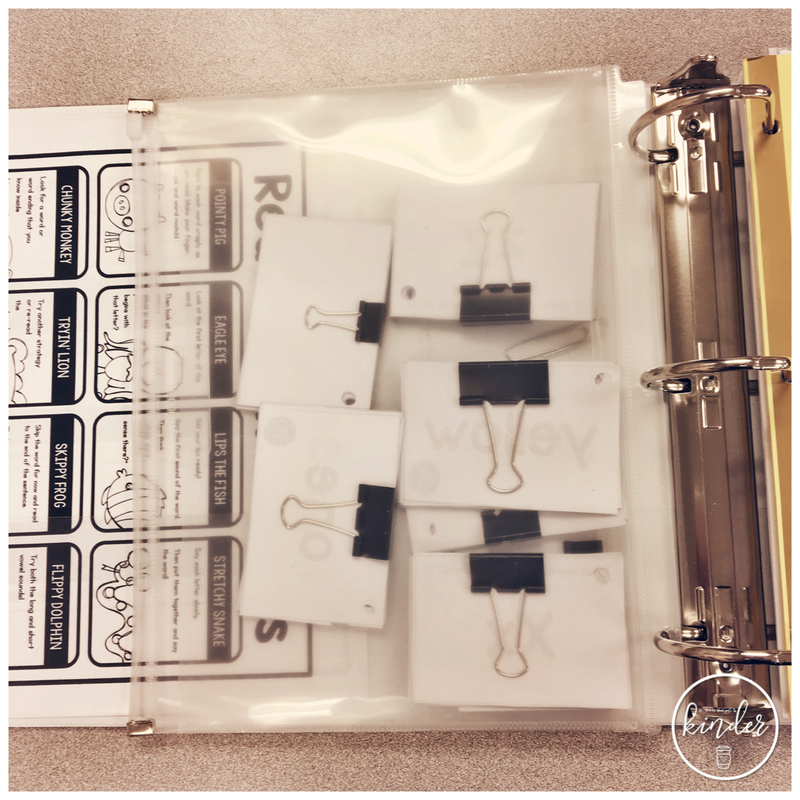 I assess all kids on their letter ID at the beginning of the year and reassess as needed throughout the year. I keep track of this using the sheet below (included in the alphabet ring pack above). The four tests above are all taken from Mary Clay's Observation Survey. We submit this data to our admin each month. I keep the originals in each tab. 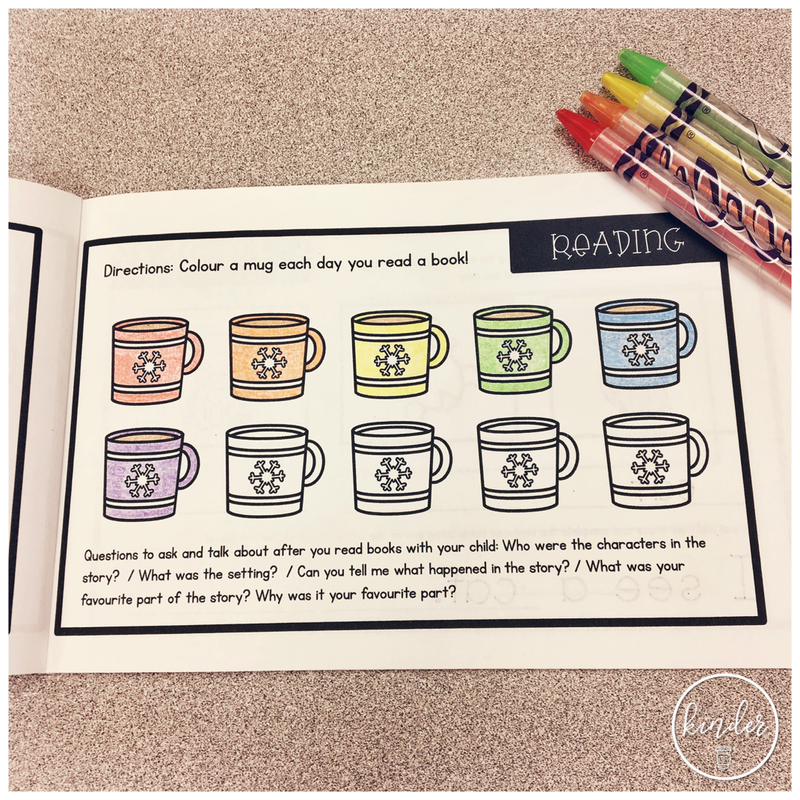 Each month I do running records with the kids who are reading. They go into each tab by month. Although I am assessing during guided writing, through inquiry writing etc. I also make sure I pull out my writing rubric and assess at least one piece of writing at the end of term 1 and term 2. 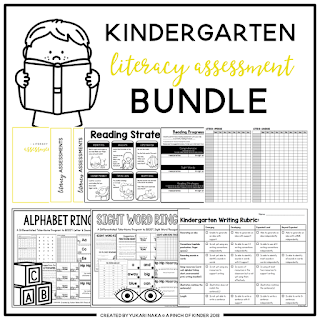 I staple the writing to the rubric and keep a copy in my assessment binder. My writing rubric can be found here. I keep my tracking sheet for my sight words here so I can highlight them as they master the words on their sight word ring. 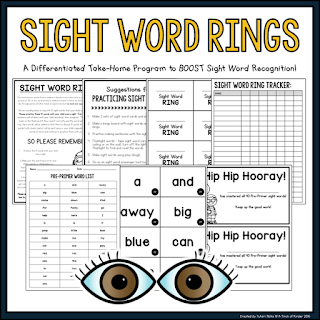 These can be found in my sight word ring resource above. I try to highlight in a different colour each week so that I can see how much progress they are making week to week. 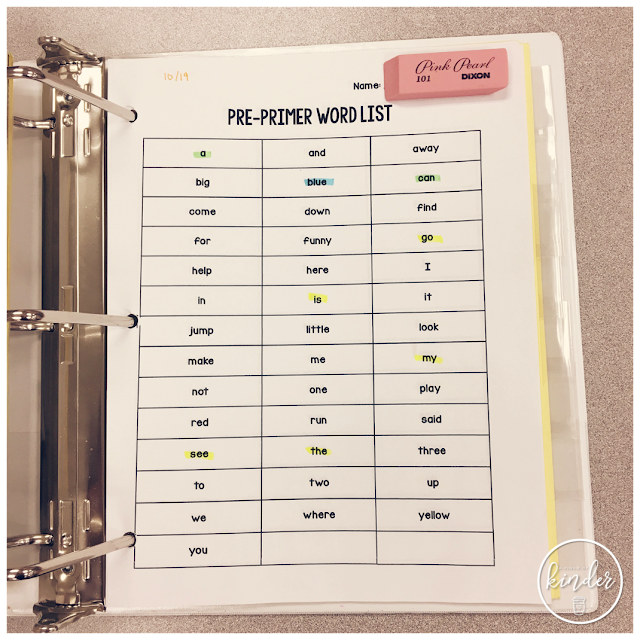 I get a lot of questions about the printables I use in my literacy binder. I pulled them from various files originally, but I recently put them all in one place. 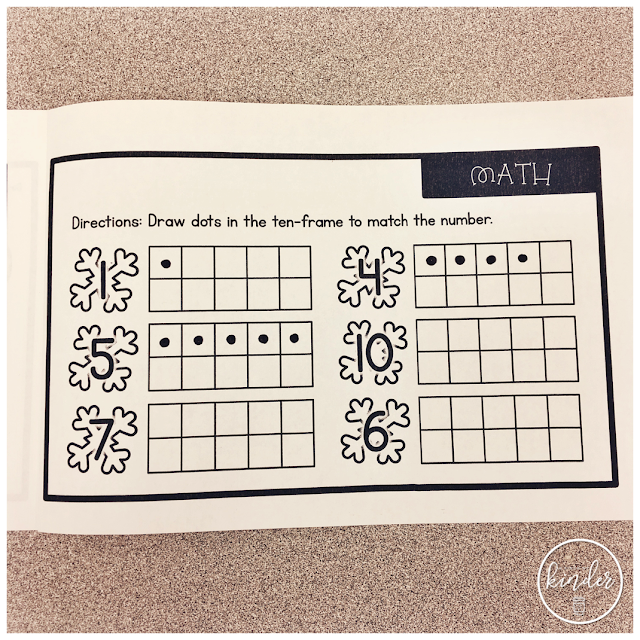 Click on the image below to check out more Five for Friday blog posts!